ScoutFinch 168 3.5 Psychology Female No CA 2011 Accepted Full tuition scholarship, must remain in top third of class. Vegas_Rebel 167 3.9 3.7 Philosophy Male No NV 2010 Accepted Full ride must maintain top 1/3 standing. gofpro@gmail.com 164 3.8 3.9 Criminal Justice Male No NV 2011 Accepted $5k per year schol. smack4ud 164 3.3 3.3 Political Science Male Yes CA 2008 Accepted Full scholly. Casper_n 161 3.5 3.1 Communications: Public Relations Male Domestic Waitlisted then accepted LOCI's work! panicpineapple 157 3.4 English Female Yes CO 2014 Accepted Out of state tuition scholarship for 1L, in-state tuition for 2L and 3L if ranked in top 50% of class. tom1986 154 3.5 3.5 International Studies Male NV 2008 Accepted Open House - April 18th! fireLaw 152 3.7 3.7 Public Admin Male No NV 2011 Accepted Part-Time Evening. Complete 11/1. Reviewed 12/13/10. Accepted 04/22/2011. shadetree 147 3.6 3.6 film NV 2011 Rejected Weird on personal statement. 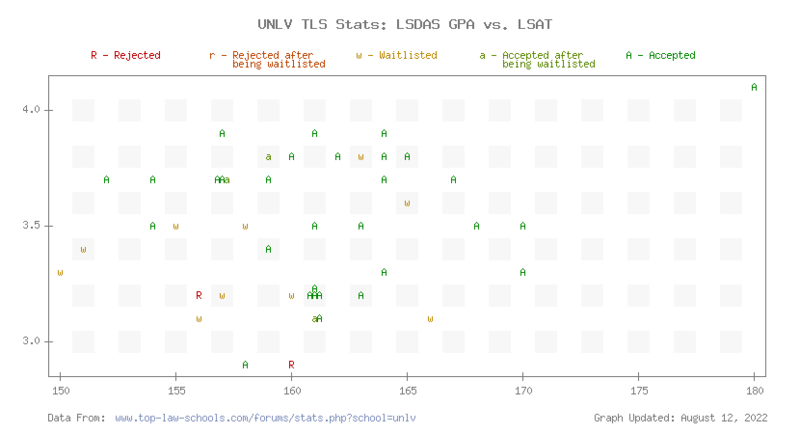 Be sure to check out the TLS Profile on UNLV Law.